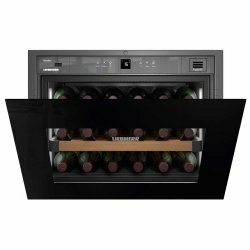 A built-in wine storage cabinet with glass and choice of door finish in stainless steel, black glass or white glass door. The 1803 is a smaller and more unusually sized wine fridge that holds (18) 750mL and features a single temperature zones. The innovative styling allows the unit to sit flush with cabinetry and its recessed handle maintains a smooth line. When designing the custom kitchen, take the flexibility to put this unique modular unit anywhere. The temperature is adjustable and the LED ceiling light is dimmable to cast a cool glow across the room. Liebherr Kitchen focused wine cabinets are brought into Canada via – Burlington, Ontario, Canada, L6L 2X8 and into the US via Newport News, VA, Virginia, United States of America. Liebherr has specific trading areas within the US. We may not be able to sell a Liebherr into your area. Delivery rate indicated is for "White Glove" set in place delivery. Cheaper Delivery rate may be available to your area. Please inquire with Zip or Postal Code & we can let you know your options. What will determine your shipping cost? -2 years parts and labor. -5 years parts and labor on the sealed system/compressor. -12 years parts warranty on the sealed system.